Are you dreaming of a white Christmas? The chances of that happening are revealed in an updated map from NOAAÃ¢â‚¬â„¢s National Climatic Data Center (NCDC). The map shows the climatological probabilities of a white Christmas across the United States. 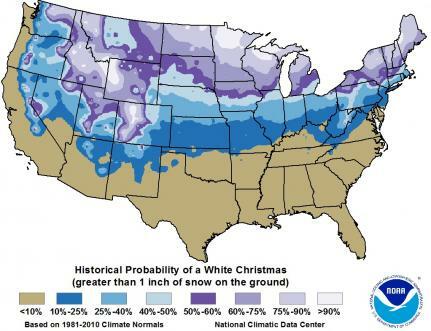 Based on the most recent 1981-2010 Climate Normals, the Probability of a White Christmas map shows the climatological probability (in percent) that a snow depth of at least 1 inch will be observed on December 25. Time to check out I.I.I. tips on winter proofing your home. See NCDCÃ¢â‚¬â„¢s U.S. Daily Snowfall map to keep track of the snowfall across the U.S. on a daily basis.